Spiritual success followed Paul through Philippi, Thessalonica and Berea. But in Athens, he faced the daunting task of converting the smug intelligentsia. Sadly, there were no mass conversions that day, no miracles recorded, no great church established, not even a good riot. “Nevertheless” some believed such as Dionysius, Damaris, along with a few others. These were real people, who were surrounded by the numbing effects of humanism and idolatry. Yet, despite the demonic forces at work in their city, they believed. If they can come to Christ, then anyone can. So friend, press on through the discouragement and keep faithfully sharing the good news. 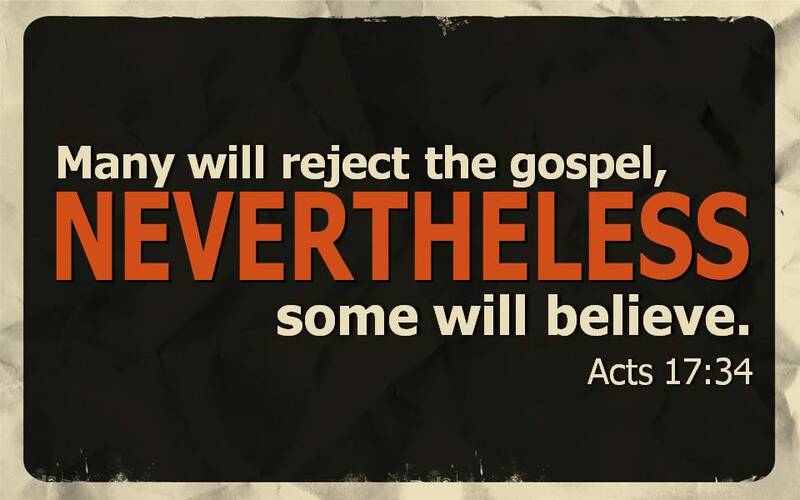 Many will reject it, “nevertheless” some will believe. Obedience, God’s Firm Foundation, New Heavens And A New Earth and Of Christ’s Sacrifice.